Coexisting with Large Carnivores -SW Alberta Initiative. Posted in bear talk ! | Comments Off on Coexisting with Large Carnivores -SW Alberta Initiative. The Coyote-Wolf-Bear Education Initiative involves Sampson, Barron and McIntosh. Taking to the road traveling town to town, engaging citizens. Removing the myths regarding coyote, wolf and bear. Stay tuned for more to come! Meet our team! Email: coyotewolfbear@outlook.com (copy and paste email). Ontario Nature takes aim at the Spring Bear Hunt. 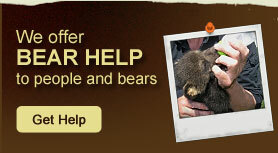 Read to learn more about the lies and misinformation about bears. Posted in bear talk ! | Comments Off on Ontario Nature takes aim at the Spring Bear Hunt. Killing snares are inhumane. Canada needs to get rid of them. Bear With Us photo. Wildlife killed in snares. CBC Radio interview with retired trapper. Posted in bear talk ! | Comments Off on Killing snares are inhumane. Canada needs to get rid of them. Bear With Us Fundraiser – March 18,19,20 / 2016 via Facebook online. Posted in bear talk ! | Comments Off on Bear With Us Fundraiser – March 18,19,20 / 2016 via Facebook online.